CheatBook-DataBase 2011 is a freeware "cheat-code tracker" that makes hints and cheats (for PC, Walkthroughs, Playstation 1, Playstation 2, Playststation 3, Sega, Nintendo 64, DVD, Gameboy Advance, iPhone, Gameboy Color, N-Gage, Nintendo DS, PSP, Xbox, Gamecube, Dreamcast, Xbox 360, Super Nintendo) easily accessible from one central location. If you´re an avid gamer and want a few extra weapons or lives to survive until the next level, this freeware cheat database can come to the rescue. Covering more than 20.000 Games, this database represents all genres and focuses on recent releases. Games are listed alphabetically in the left-hand window. When you click on a game name, the relevant cheat is displayed in a editor window, with convenient buttons that let you print the selection or save any changes you´ve made. In the latest past many users of the CheatBook-DataBase and readers of the monthly being published magazine have sent to us small error messages and suggestions for improvement again and again. In order to arrange the program better, more comfortable and more efficient also in future, we are further on in need of your ideas and suggestions for improvement So if you have a suggestion for a new feature, if you have found a bug, or if you know software archives in which the CheatBook-DataBase is not yet provided for download, just write and let us know. Setup is a snap. 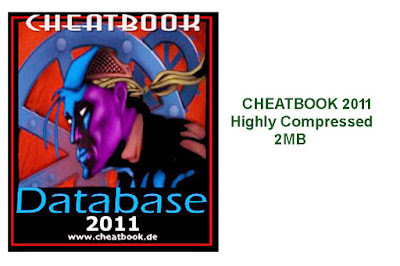 Once CheatBook-Database is on your hard drive, use it as much as you want because it´s free.